In the "olden" days, women could do everything. They could sew and make soap and knit and draw. They could also milk cows and tend sheep. But even when women had money, later, when pioneer days were long over, they were taught the "domestic" arts. Then, during industrial times, when women were routinely the lowest rung on the fabrication ladder, the domestic arts were out of favor. It was thought if you were a clever girl you should go to a big office and make gobs of money. I love domesticity. I love to knit and sew and cook and thank my mother silently each time I take up a needle or a wooden spoon. I don't think it's taken away from my left brain stuff. Is counting stitches any less complicated than managing an excel sheet? All these thoughts came at me in a wave of pattern and color at the Hammer Museum a few days ago at the opening of their new exhibition of nine visionary California artists. 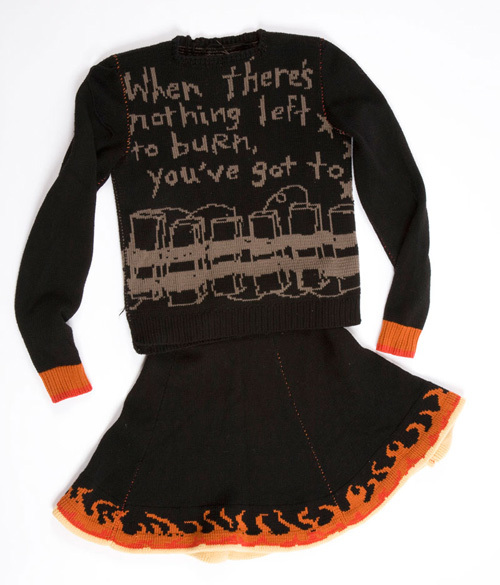 Though many of the artists are accomplished draftspeople, it was the work of Lisa Anne Auerbach that had me hopping. Auerbach has found a way to combine her politics, her humor, her writing and her domesticity and it sure doesn't feel secondary to me. 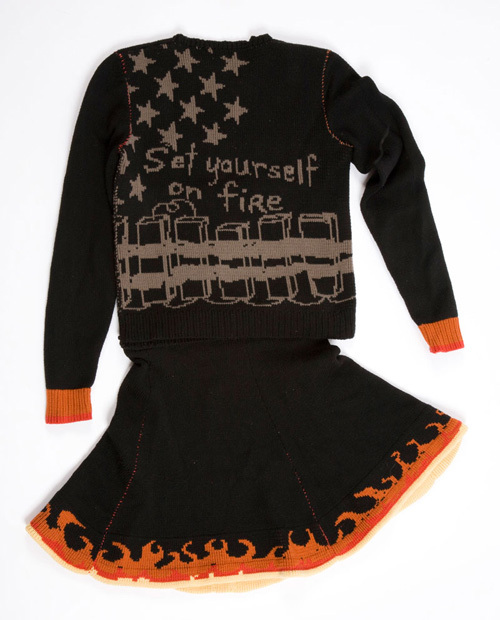 Taking the motif of a fifties style skating sweater and skirt, Auerbach has riffed on some of the themes of the recent election and other hot topics. She does all her own knitting. And writing. You may ask, as I did, is it art or just fabulous t shirts kicked up a notch? When I suggested to Auerbach she might want to make her very cool pieces for Barney's in cashmere, she was patient with me. I'm sure I wasn't the first to ask. 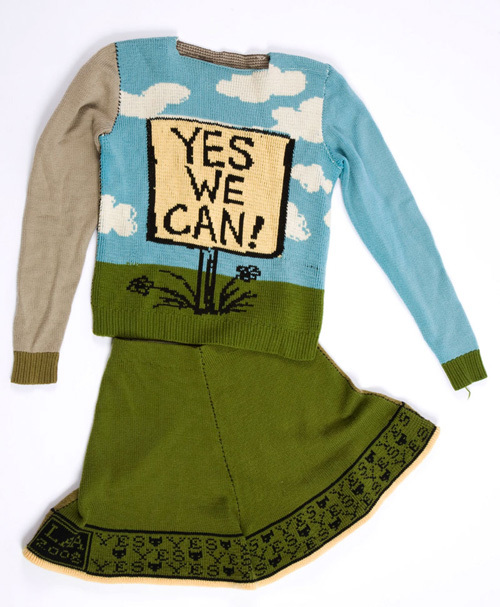 Then she answered: "Working the way I do, I am able to make something that responds quickly to current events. 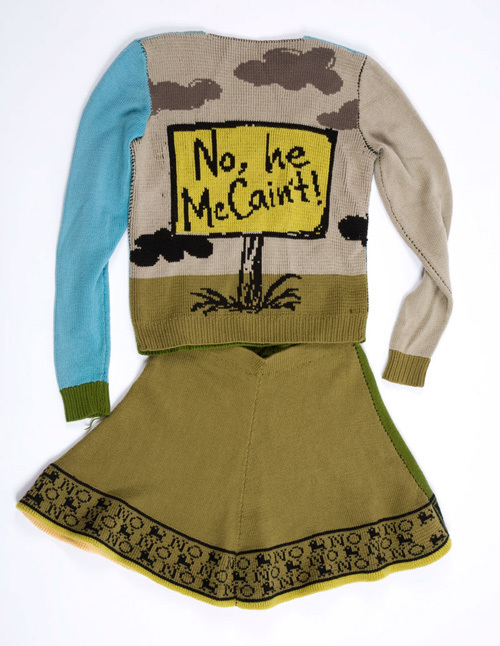 I can be pissed off about something in the news and wear a sweater about it the next day. 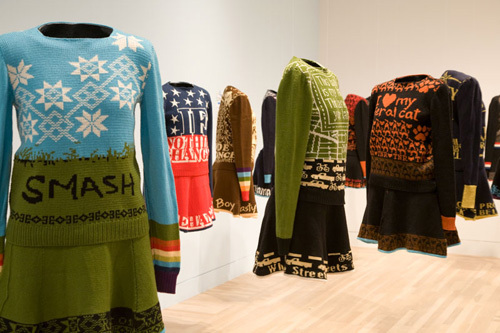 I'm not planning seasons or collections in advance, and so there is a real immediacy in some of the sweaters, making them more akin to journalism than to fashion". 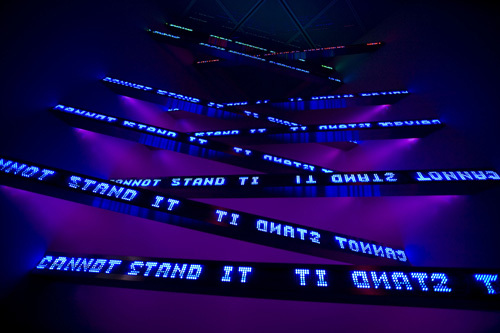 In a bi-coastal counterpoint, the survey of recent art by Jenny Holzer at the Whitney curated by the talented Elizabeth Smith from the Museum of Contemporary Art in Chicago, showcases a different way to deliver a similar message. Holzer is auntie to Auerbach, her pithy, political statements have been gracing museums and the realm of public art for many years. Blue Cross by Jenny Holzer. Photographed by Lili Holzer-Glier. But Holzer is not about domesticity. One section of the show focuses on government documents she obtained under the Freedom of Information Act (I once had to request one of these. The whole thing except for and and the was redacted. Some freedom!) Holzer uses this "black out" of text in the non-traditional medium of LED, as well as the more traditional one of painting. While Auerbach is compared to Tina Fey, Holzer feels more like an Edith Wharton, someone whose comments about society have a painful resonance, who calls it as she sees it about "pain, love, peace and survival" through a darkly tinted lens. As Auerbach uses yarn in pieces like her Body Count Mittens (that channel Iraq casualties, not part of this show) Holzer uses ribbons of LED to comment on Iraq and the former Yugoslavia. 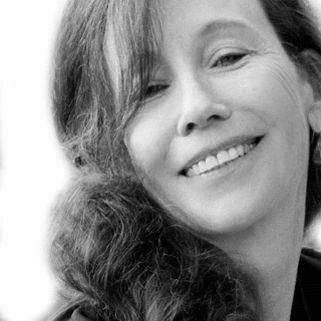 As Auerbach says she depends on humor to deliver her messages (and the Huffpo, she says, for inspiration), Holzer uses starker methods to comment on war. Their weapons are graceful barbs, the double entendre, Joycean repetition, literary conventions that translate oddly effectively to the realm of art; both want to connect with the public to raise awareness, for a reaction. Smith says, "There's a long history in the 20th century starting with Picasso and Gris in their cubist collages and then Duchamp, Magritte in the 20s and 30s but in the post-World War II period words have been used most heavily and effectively by artists such as Bruce Nauman and Joseph Kosuth, with more recent artists such as Roni Horn and Jack Pierson also using words for visual and conceptual purposes." The Constitution gives us the right to remain silent and sometimes this is the prudent course. Jenny Holzer and Lisa Anne Auerbach are not content to do that. On our behalf, they cajole, incriminate and put in relief some of the most pressing issues of the day. Jenny Holzer: Protect Protect is on view at the Whitney until May 31st; it then travels to the Fondation Beyeler in Switzerland. Lisa Anne Auerbach is part of the Hammer Biennial invitational exhibition Nine Lives: Visionary Artists from Los Angeles, which is also on view until May 31st and will not travel.